James Harris Gallery | Gary Hill: "Dream Stop"
James Harris Gallery is pleased to present our third solo exhibition titled “Dream Stop” by Gary Hill that features all new work. For this show, Hill constructs an environment of ubiquitous closed-circuit surveillance, each piece containing hidden cameras that capture distorted or fragmented footage of the exhibition space and viewer. Hill continues his interest in systems of communication and the sociopolitical implications of new technology. Surveillance evokes themes of voyeurism, paranoia, and the omnipotence of a policing authoritative force. But it also relates to social media, our culture of image production and the obsessive capturing of our own experiences. Hill’s Self ( )’s series both entices the impulse to participate and thwarts our expectations and desire to have control of this projection of self. 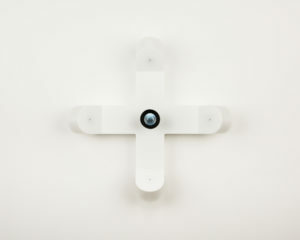 In the middle gallery, the five wall-mounted works first appear as abstract sculptural objects, designed into simple geometric forms of white glossy Plexiglas that gives them an institutional air. Each of these objects has an ocular or two, small view finders for the viewer to investigate. Self ( )’s reveal how the desire to look results in the inability to see the whole. 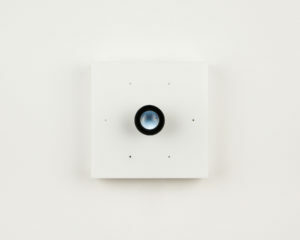 Strategically placed on these wall-mounted sculptures are discreet cameras that capture a specified area of the viewers’ body. The artist adds an additional camera to each progressive sculpture, so that the first triangular shaped piece has a single image, and the last long rectangular work has a total of six angles. As the view clicks through each camera, the experience is unnerving wherein gazing, the viewer is forced into the apparatus, their body becoming subject. 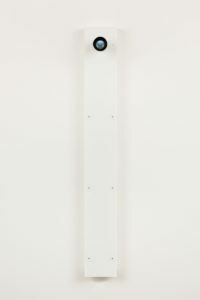 Yet the subject is disembodied, and the relationship to self estranged, creating a closed individual experience of ‘otherness’ unique to each viewer. Painting with Two Balls (after Jasper Johns) refers to the 1960 Johns’ painting that playfully responded to the rhetoric of the time around Abstract Expressionist painting as a masculine endeavor. With new media, Hill recreates a similar composition of two spherical objects, now hidden cameras, inserted into the center of the piece and breaking up the picture plane. 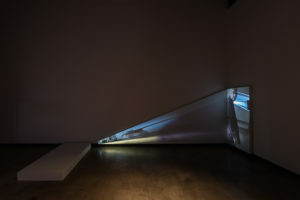 The “painting” in this case is the video projection captured by the hidden cameras, a distorted image of the exhibition space and viewer that is projected across the parallelogram shaped stretched “canvas”. Hill’s abstraction responds to current mode of communication through the moving image and addresses issues around the rise of surveillance in today’s media saturated landscape. As Johns did in the 1960s, Hill addresses problematic sociopolitical agendas with a similarly seductive playfulness. His work draws you in literally, creating a dynamic experience with the viewer that is both intriguing and disturbing. Dream Stop transforms the entire room into an alternate reality of holographic projections. The title is a play on words that when conjoined can be interpreted as a perhaps a station, a place to begin a dream. Conversely it can also suggest the end of a dream, the stopping point. 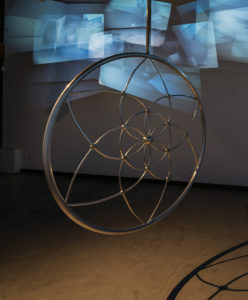 The structure that holds all 31 cameras that creates the spliced projections across the room is shaped like a dreamcatcher, associating the piece with the magic powers from a system of belief before the technological turn and suggesting the spiritual longing of new age culture. 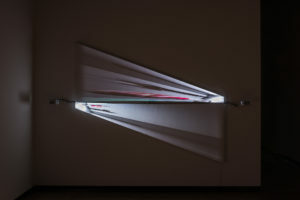 The projected image is in a state of flux, constantly shifting as the viewer moves throughout the space. Through these multiple projections, the hyper real quality of this experience resides in a liminal space where physicality and time are suspended. For Hill, liminal spaces offer productive insight into the complexities of ontological exploration. How we produce and share information and knowledge has radically changed in contemporary culture, where digital media has become embedded in our everyday lives and identities. Hill manifests this phenomenon as an eerie presence, where the source is unknown and viewer involvement itself becomes the subject and content of the work that unfolds. Just as pervasive social networks have disintegrated boundaries between public and private, local and global, official and amateur – this exhibition produces its own inescapable reality that offers a transportive yet uncannily constructed experience. Hill currently has work included in the exhibition Caméra(Auto)Contrôle at the Geneva Center of Photography. At the end of the year, he will be included in the 2016 Kochi-Muziris Biennale in India. There will be a room dedicated to one of Hill’s works in our gallery’s booth, number B14, at this year’s Seattle Art Fair, August 4-7. Gary Hill is a pioneering artist of new media and video work. His video works incorporate commentaries on society and culture as well as bringing in poetic themes and ideas. Hill considers video as a medium to be the most receptive, flexible, and far-reaching mirror of consciousness. He creates psychological spaces within his artworks that allow viewers to see this mirror of their own consciousness. Gary Hill lives and works in Seattle, WA. Exhibitions of his work have been presented at museums and institutions worldwide, including solo exhibitions at the Fondation Cartier pour l’art contemporain, Paris; San Francisco Museum of Modern Art; Centre Georges Pompidou, Paris; Guggenheim Museum SoHo, New York; Museum für Gegenwartskunst, Basel; Museu d’Art Contemporani, Barcelona; and Kunstmuseum Wolfsburg, among others. Commissioned projects include works for the Science Museum in London and the Seattle Central Public Library in Seattle, Washington, and an installation and performance work for the Coliseum and Temple of Venus and Rome in Italy. 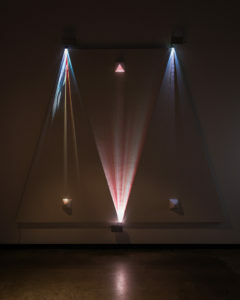 Hill has received fellowships from the National Endowment for the Arts and the Rockefeller and Guggenheim Foundations, and has been the recipient of numerous awards and honors, most notably the Leone d’Oro Prize for Sculpture at the Venice Biennale (1995), a John D. and Catherine T. MacArthur Foundation Fellowship Award (1998), the Kurt-Schwitters-Preis (2000), and honorary doctorates from The Academy of Fine Arts Poznan, Poland (2005) and Cornish College of the Arts, Seattle, WA (2011). 12" x 12" x 6 1/4"
16" x 16" x 8 1/2"
25" x 27" x 6"
54" x 7" x 7 1/4"
74" x 209" x 74"
136" x 146" x 8"
78" x 96" x 3 1/4"